I handle all the costs associated with this website's yearly upkeep and traffic and do all the work on it myself. I am grateful for any donations that can be made and applied directly to the cost of the site itself and the TNG genealogy program. Thank you. So, aparently, Abraham Lincoln and the Keiths are tied in an interesting way: They were neighbors, and one of the Keiths was present at his Birth. Jacob Keith (son of William Keith, 7) was born September 13, 1776, died June 6, 1830. He married Rebecca Hodgen, October 10, 1803, his [page 58] second-cousin. She was born November 4, 1784 and was the Daughter of Robert Hodgen for whom Hodgenville, Larue County Kentucky was named by his wife Sarah Larue, daughter of Isaac Larue of Frederick County Virginia. In a suit in Frederick County brought in 1824 by certain pairs of Isaac Larue versus other heirs, Jacob Keith and his wife Rebecca are named as heirs. Jacob Keith’s mother was Elizabeth Larue but the connection here is through his wife and not himself. They located in present Larue County, Kentucky about three-quarters of a mile from the birthplace of Abraham Lincoln. Rebecca Keith was in the Lincoln home the day Abraham was born, rendering such service as a neighbor women were accustomed to render in these times in the complete lack of Physicians. Jacob and Rebecca Keith’s children were almost certainly playmates of the boy Abraham Lincoln. Jacob Keith lived here after the Lincolns departed. In 1828 he was living in Harrisons County Indiana, after his death the widow Rebecca married her brother-in-law Gen. John Thomas. COOL, huh? we’re in George Washington’s survey Book, and now this! Updated the Alexander Keith, b 1712. This branch of the Keith Klan is not as well known(or large from what I have record of), but I used the Keith Book to add in. One large Branch Done! Woohoo! So, his descendants are added in. It’s interesting that one of his grandsons changed their named to Keeth, and a few of them changed it back to Keith as the generations went on. So there are some “Keeth” Keith’s in our lines. My wonderful Sister in Salt Lake City, went and found the actual document in the LDS Family History Library. John Keith, Jonathon Harned, and others signed an undated petition of Kentucky Settlers, presented to the Continental Congress, Aug 23, 1780, praying for relief in regard to the conditions for taking up land. So It does exist! And at the bottom is a note that the actual document is in some file, and I’d love a copy, so to have John Keith’s Signature. Anyone nearby?? Thanks! My brothers and I have been transcribing the Manuscript I have copied from Microfilm found in the LDS Genealogical Library. We’ve gotten about 50 of the total 140 some-odd pages. I thought I’d share what we have transcribed so far. On the top of the page is a link to the first 88 pages of the manuscript if you would like to download and look at them. If anyone is interested in helping, please let me know, I’ll have you transcribe a few pages. It takes about 20 minutes to do a whole page. * Alexander Keith of Baltimore, MD - I think this is the book I have microfiche scans of. I’d like to see a better copy though, since mine was really dicey. * Notes on Enoch, Cox, Keith, Larue, Chenoweth, Bean and related families. I found the ONLY copies of these items is there, so I talked to my dad about taking a trip in November there. So begins the collecting! This is a new beginning for Keithklan.net I need to get this together so we can really do some genealogy!! This is David Keith, 7th great grandson of Alexander Keith of Baltimore, MD, 1682, and we think originally of Edinburgh, Scotland. 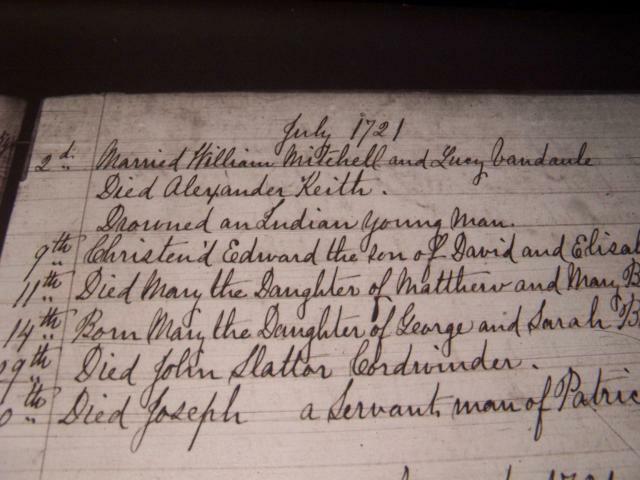 Alexander Keith is my (David Keith b 1978) 7th Great grandfather. What an amazing lineage! I cannot believe I am able to trace my roots back that far. So, in an endeavor to go even farther, and to connect with family from all over, I have sought to make this website available and seek out those who I have found who are interested in him and his work. These links are the culmination of any thing I could find and I post them here. If you have any others (and especially if you want to be included on this list) This is for anyone with knowledge, links, etc. * Arthur L. Keith, was a professor in South Dakota and renown genealogist. He did massive research in the Harned family and did a great work with the Keith family in a manuscript I found on film at the Family History Center in Salt Lake City, Utah. We are currently working to type up this manuscript to be used as a resource for all. * The Keith Family Genealogy Forum has a forum for all types of Keith genealogies. I haven’t had much luck there for our line, but I’m going to change that. * This is theForfar Forum, which is the surname of Alexander’s father in law who also came to Scotland. · If you’re going to study any of the Keith lines in America, an invaluable resource and to one which I relied heavily is Collected Genealogies of Keith, Keith & Keeth Families in North America. There are a few errors that I have found through research, but it’s only meant to be a guideline. You can still order it and also find many links to other Keith resources here. The man who collaborated the work is always watching the Keith Forum, and you’ll see his comments everywhere.